Pope Benedict XVI Says He Dismantled Vatican's 'Gay Lobby', "As Pope Francis said, who am I to judge?" ... "In a new interview-book, the emeritus pope admits to the existence of such a lobby, but says it had only “four or five members” and that he’d managed to dismantle it. Benedict XVI, Final Conversations is the title of the book to be released worldwide on September 9.This is the first time a pope, or a pope emeritus, has acknowledged on the record that the Vatican either has or had a “gay lobby”. Pope Francis reportedly said one existed soon after his election in 2013, when he had a private meeting with the leaders of the Latin American Confederation of Religious Orders (CLAR). Yet the Vatican said that encounter was a private one, and CLAR released a statement saying the words couldn't be attributed to the pope." Bridget Mary's Response: As Pope Francis said, "who am I to judge?" Be aware that you dwell in infinite love, here you experience boundless forgiveness, compassionate healing, and liberating empowerment. So in this meditation practice, sit still, be aware of your breath, if you need a prayer word to center you, select on, such as God, Love, Sophia, Jesus… whatever feels appropriate for your journey at this time. The object is not to think about anything or feel anything, it is simply to be mindful of the present moment where you dwell in the Holy One in love beyond imagining. This exercise, can be done in silence and in small groups of 2 or 3. We are instrument of God’s loving presence \for each other. When praying, let the love in the heart of God for this person flow through you… when receiving, open yourself to receiving the spiritual treasures in this prayerful encounter. metaphors , we let the words sink deeply into our minds and spirits. As we come with receptive hearts and listen deeply, new doors to the sacred unfold that reveal the indwelling presence of divinity in our midst. 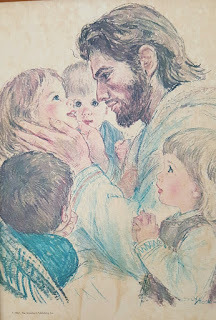 One example, Jesus said: “ I am with you always.” This biblical verse has filled me with deep joy in times of rejoicing and great comfort in times of struggle. We are created in the image of God and a sanctuary for God's presence in our world. As Jan Richardson writes: "We can also practice lectio with our lives. Our experiences, our memories, our stories, all that we carry around within us, this is material for pondering, for reflection, for prayer Inscribed with the word of God in our very being, we are ourselves sacred texts." ( Jan Richardson, In the Sanctuary of Women, p. 127) When we see ourselves and others as the face of God in our world, we can contemplate the holy presence of divine love, strength, healing, and peace in our every breath, in our every thought, word and deed. A whole new world, beyond anything we could ever imagine opens up to us. In our lives heaven and earth meet- no matter what happens-God is embracing us with abundant love. Keeping a journal, painting, poetry or any of the creative arts can help us grow in consciousness of our lives as sacred texts. When the way is clear, we give thanks . When the way is painful, we pray for healing and strength. When we get lost in the complexities and complications of our lives, we pray for wisdom and discernment. When we experience rejection and confusion, we pray for forgiveness and illumination. When we face obstacles that challenge us, we pray for solidarity and joy as we accompany one another on the journey. May Holy Wisdom accompany us as we minister to one another and celebrating our oneness and diversity as the face of God in our world. Published: Wednesday, June 29, 2016 at 6:30 p.m.
Last Modified: Wednesday, June 29, 2016 at 6:30 p.m.
SARASOTA COUNTY — The smell of salt and sunscreen filled the air at the Sarasota Outboard Club on Wednesday. Under the covered area overlooking Sarasota Bay, Seth Winners, 27, looked straight into the eyes of one of the volunteers, Brandon Kirsch. “It is on, señor,” Winners said seriously, the neon green color from his shirt reflecting in his glasses. He bet he could catch more fish than Kirsch. If he lost, he vowed to eat 50 hamburgers. Winners was one of the 74 participants in the Sarasota Powerboat Grand Prix Festival's Friendliest Catch Fishing Tournament. The event gives children and adults with special needs the opportunity to interact with local fisherman and catch some fish. “He loves going out on the boats and meeting the captains,” said Kathryn Shea, Winners' mother and the CEO for the Florida Center for Early Childhood. Shea adopted Winners when he was 4 years old, but has been with him since he was 4 months old. Winners was born with fetal alcohol syndrome, a condition caused by alcohol consumption during pregnancy. Winners was born intoxicated, and spent the first five weeks of his life on a ventilator, Shea said. At one point, Shea was worried Winners would have to be institutionalized by the age of 7, because his brain damage was so severe, she said. Despite this prognosis, Winners progressed and thrived. He attended Oak Park School, and is now at Community Haven in Sarasota. Winners regularly attends events in the community. The tournament has been a staple in Sarasota for the past 34 years. Winners has participated the past six. In total, 33 boats went out on the water. Winners boarded a boat with 15 other participants and volunteers for the afternoon. Once out on the bay, everyone was eager to get their lines in the water. Winners dropped his line, a pink shrimp dangling off the end. “Here fishy, fishy, fishy. Come to papa,” he chanted, anxiously looking down at the water. After losing some bait to fish passing by, he finally felt a tug at his line. With the help of the captains on board, Winners reeled in a fish of his own, all while grinning ear-to-ear. He named it Leo. He kissed it. Then, he released it back into the water. The group caught eight fish total. Winners caught two. After the few hours on the water, the boat headed back to the Sarasota Outboard Club, where lunch was served to all of the participants and volunteers. Laughter filled the club, everyone reminiscing over their time on the boats. “Everyone gets a great day on the water. All of the volunteers and liaisons' faces really light up,” said Don Mcguire, co-chairman of the Friendliest Catch. Mcguire and his wife, Kim Mcguire, have run the event the past three years. He previously was a captain for one of the boats for 10 years. At the end of the tournament, awards are given out. Each participant in the competition gets a prize for partaking in the event. Although the event just happened, Winners is already waiting to get back on the water next year, Shea said. “When it's over, he always asks how many more days until we can come back,” she said.tains on board, Winners reeled in a fish of his own, all while grinning ear-to-ear. “When it's over, he always asks how many more days until we can come back,” she said." an organization founded in 2002 in Germany. in 2006 and a womanbishop in 2010. "We are not restricted by the past." seven women on the Danube River in 2002.
they continue to ordain priests in the Apostolic succession. ordinations they perform are "valid but illicit,"
as they are in violation of Canon Law. steadily declining from two in 1965 to one in 2015.
which allowed her to spend more time with her children. Truelson found a program called "A Course in Miracles." First she took the course; now she acts as a facilitator. Now Truelson feels that she has found her home in the RCWP. 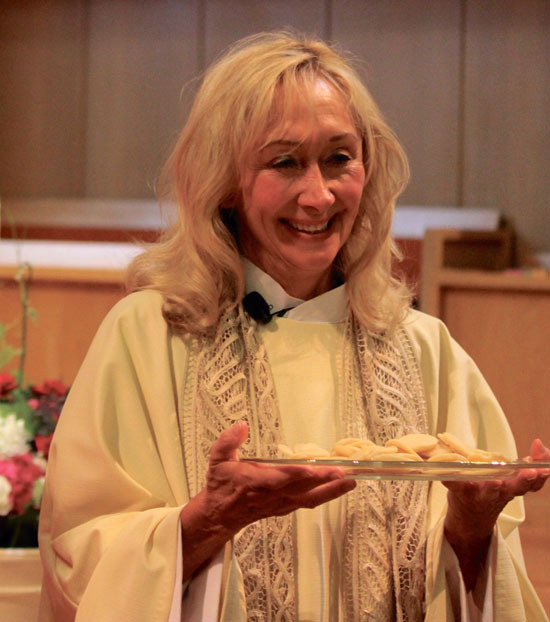 Saturdays of each month at the Orinda Community..."
Mary of Magdala to a feast on par with those of the other apostles doesn't nearly begin to cover it. [I]t is right that the liturgical celebration of this woman has the same grade of feast given to the celebration of the apostles in the General Roman Calendar, and shines a light on the special mission of this woman, who is an example and model for every woman in the Church. Bridget Mary's Response: Finally, the Vatican quietly affirms what contemporary scholarship concluded and the early church fathers taught -- St. Mary Magdala was the apostle to the apostles. In my view, the Vatican owes St. Mary of Magdala and the entire church an apology for portraying the first witness to encounter the Risen Christ as a prostitute. 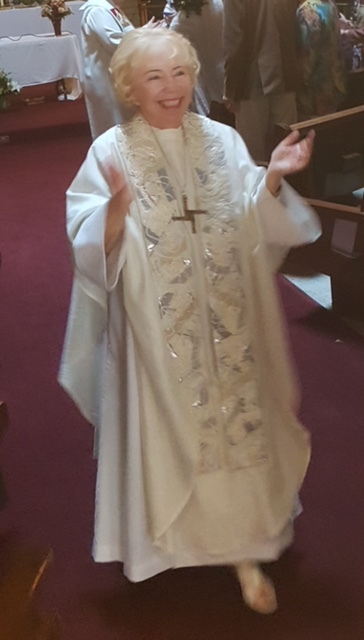 I am grateful for Sister Schenk who has done so much to promote parishes celebrations of St. Mary Magdala on July 22nd over the past decade. Many of our inclusive Catholic communities have used Future Church's resources in crafting liturgies in honor of the the Apostle to the Apostles for years! St. Mary of Magdala, the statement says, "has the honor of being the 'prima testis' [first witness] of the Lord's Resurrection. ... [and] Precisely because she was an eyewitness of the Risen Christ, she was also, on the other hand, the first to bear witness to him to the Apostles." I'm not sure if most of us realize just how big of a deal it is to have the Vatican say St. Mary of Magdala was not a prostitute but an apostle in her own right, and the first to witness Jesus' Resurrection. Oh, you didn't see the "not a prostitute" part? Well it's there, but obliquely concealed by some tactful backtracking from Pope Gregory's disastrous sixth-century sermon that combined three New Testament women -- Mary of Bethany, Mary of Magdala and the female "public sinner" who washed Jesus' feet with her tears -- into one big time woman-sinner-prostitute. This biblical female Frankenstein's monster was, of course, forgiven by homily's end -- but not before inflicting great damage to the historical memory of Jesus' faithful women disciples. And, I believe, to the religious psyches of women down to the present day. Thus began a long and destructive tradition in the west of remembering St. Mary of Magdala as a prostitute rather than the first witness to the Resurrection. Thankfully, the Eastern church never adopted the "forgiven prostitute" slur but always honored her as the "apostle to the apostles." The Vatican's June 10 statement never quite says that Pope Gregory (and succeeding churchmen) got it wrong. Instead it alludes to work done by the Bollandists, a Jesuit group renowned for research into the lives of the saints, who "made a detailed study of the problem of identifying these three women and prepared a path for the liturgical reform of the Roman Calendar." I'm guessing not. That is because you have to fill in the blanks with one more obscure fact. The 1969 reform quietly changed the July 22 Gospel reading for St. Mary of Magdala's commemoration from the one about the "sinful woman at Simon's house who loved much" (Luke 7: 36-50) to Jesus' Easter appearance to Magdalene and her subsequent apostolic commissioning (John 20:1-2, 11-18). But did a Vatican office or official ever tell anyone? Were there any public announcements such as, "Hey folks, St. Mary of Magdala wasn't a prostitute after all. We got that one wrong and now we're making it right." So who knew? Basically no one knew except for the Scripture scholars. And I thank God for them. I was appalled to discover there is no evidence whatsoever that Mary of Magdala was a prostitute but ample evidence in all four Gospels that she was the first witness to the Resurrection. And I vowed to let people know who she really was somehow. Enter God's inscrutable providence. In 1997, as director at FutureChurch, it gave me great peace of heart to at last fulfill my vow by launching a national campaign to restore St. Mary of Magdala to her rightful place as the apostle to the apostles. We asked our supporters to sponsor special celebrations on or around July 22 at which a biblical expert would trace Mary's unparalleled fidelity in accompanying Jesus through crucifixion, death, burial and resurrection. This would be followed by a prayer service at which a woman would preside, preach and encourage attendees to reflect on their own encounters with, and witness to, the risen Christ. Our first Cleveland celebration attracted 200 people to a local parish where Fr. Smiga spoke. A friend encouraged about eight women from her 12-step group to attend. 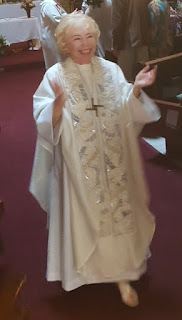 To my surprise, they wept unrestrainedly throughout the prayer service that was created and led by pastoral minister, Laurel Jurecki, who was clothed in a white alb. It dawned on me then that we were touching something very deep within the Catholic female psyche. A long-buried wound was slowly being brought to the Spirit's healing light. Annual celebrations of St. Mary of Magdala completely exploded after that, going from 23 that first year, to 150 the following year to between 250 to 400 celebrations worldwide in each of the last 17 years. Every summer, thousands of women and men helped correct an egregious injustice done to a great woman leader in our church. Along the way they also worked to correct present day injustices by committing to write, educate and advocate for reinstating female deacons, restoring deleted women to lectionary texts, encouraging women preachers and standing up for Catholic nuns under fire from Rome. This year FutureChurch has created a celebration around the theme of building a church for our daughters with user friendly resources designed for parishes, schools, private homes and small faith communities. The initiative comes not a moment too soon because according to current research: "Unlike their grandmothers and mothers, Catholic women born after Vatican II seem less willing to give the institutional church the benefit of the doubt and to stay loyal to the Church and Catholicism while hoping for change" (D'Antonio, Dillon and Gautier in American Catholics in Transition, pp. 96-97). There is much to celebrate this July 22. The Vatican finally gets it that St. Mary of Magdala is an apostolic model in our Church on par with the male apostles. But will our daughters even care? Or will they walk away sad because they simply won't sit in a pew and allow themselves to be disrespected as their mothers and grandmothers have been. This is where the Holy Spirit comes in to do her thing. But She needs our help. Check out this new A Church for our Daughters campaign sponsored by over 30 church reform organizations and download a St. Mary of Magdala celebration and involve younger women. St. Mary of Magdala thanks you -- and so do I." and therefore representing the church's mission to Israel. Matthew and Mark also tell of the sending of the twelve. that we heard in today's Gospel. Like the twelve, the seventy-two is symbolic. it's seventy in some, seventy-two in others. and Jacob had seventy descendents. And that message begins with peace. not the violent or the greedy or the hate-filled. freely adapted Jesus' words to their own circumstances. The word of God is not abstract. It doesn't exist in a vacuum. to learn how we are called and sent to preach the good news. apostles of peace in our time. But how can we possibly bring peace to this world? Or maybe the question is how we can BE peace In the world. Down at Claver House this week I noticed Katy being peace. She and her husband Rob are regular guests. Katy greets folks by name when they come in. she'll get up and get them a refill. And she does all this with cheerful respect. Rob calmly and firmly asks them to quiet down. I've seen him defuse some situations that could have turned nasty. Katy and Rob are peace in the world. she realized that her life did not include people of color. and she went to church with them. But she went home to a white suburb. So she decided to integrate her social life. of different races and backgrounds. I remember my Aunt Anne being peace in the world. and always an invitation to stay for the next meal. she was on the step with a cake to welcome them. She volunteered at the Church. whether it was a ride to the doctor's office or a listening ear. asking the right questions and never criticizing. just by being who she was, all without saying a word. marks made by a life of gentleness and a loving spirit. to be like the marks of Jesus on his body. to preach peace and practice nonviolence. but we can bear the marks of Jesus in our hearts. Those marks are visible, especially in the world we live in. No one of us can bring peace to the Middle East. No one of us can stop the killings on our city's streets. What we can do is be peace right where we are. we can stand on a street corner and hold up a sign. we can urge peace in the middle of turmoil. we can build friendships with people who are different from us. to family and friends and neighbors. and we too will become peace in the world. The lesson here is : do not underestimate the power of hardliners in the Vatican Curia to oppose Pope Francis' agenda of openness to dialogue and to a more pastoral approach in the Catholic Church. One example is Pope Francis recent announcement of a commission to study women deacons. Some of the Curia fear the changes that a church that treats women as equals and partners--like Jesus did in the Gospels. Indeed, ordaining women deacons would be a first step towards gender equality that could shake the patriarchal power structure to its core! The stained glass ceiling would crack, rocking the good old boys club top down approach. In my view, this would be a positive development as women bring their gifts to minister at the Table. The church would grow, flourish and become more whole. The Pope's recent apology to gays and mistreated women is opening doors to further dialogue and much needed healing in our church. While these words must be followed by changes in teaching, policies and laws, Pope Francis has made a courageous beginning. 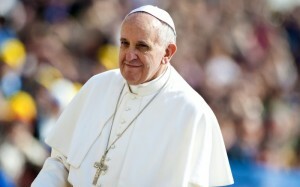 My prayer is that Pope Francis hangs in there through the hostility and opposition of the Vatican Curia. All of us are the church, not just the hierarchy. Let us stand together with Pope Francis, in loving solidarity, as we work for justice, equality and renewal! Pope Frqncis Says Christians Must Apologize to Gay People and "Mistreated Women" for Marginalizing them, How About Women Priests? Bridget Mary's Response: I am deeply touched that Pope Francis asked forgiveness of gay people and of "mistreated women." Pope Francis' words reflect the compassionate heart of Christ for those on the margins whom the institutional church has hurt through centuries of its toxic teachings and punitive policies. May this apology lead to a change in teachings, policies and actions that promote a healthier church that proclaims the spiritual equality of all the baptized. The Catechism of the Catholic Church needs a major revision. If we are to live Christ's love as Catholics we cannot teach that anyone is objectively disordered! Each person is the beloved of God called to reflect the loving face of the divine in our world. No exceptions! I pray that Pope Francis will begin a dialogue with our international Roman Catholic Women Priests Movement that will lead to the dropping of excommunication and punishments against our members and supporters. We are following our consciences and leading the church into living Gospel equality now. As Francis initiates the commission to study women deacons, he could also begin a healing process of the wounds of sexism with a dialogue with women priests. Bridget Mary Meehan, ARCWP, www.arcwp.org, sofiabmm@aol.com. 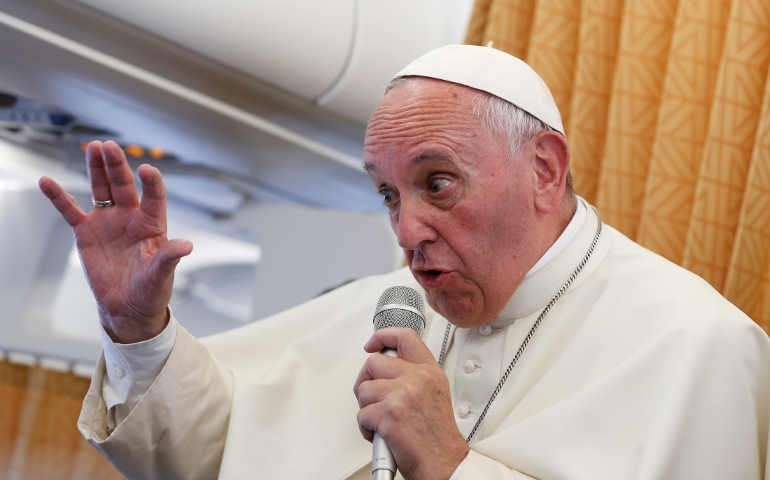 "In a press conference Sunday on the flight back to Rome after his weekend trip to Armenia, the pontiff said bluntly: "The church must say it's sorry for not having comported itself well many times, many times." "The matter is a person that has that condition [and] that has good will because they search for God," said the pontiff."